I consider myself somewhat of a Shakespeare buff – not an expert, per se, not a scholar, in a formal sense, but an enthusiast never-the-less. I used to be an actor, and have performed many of Shakespeare’s well-loved works. I have also studied his plays, both formally and informally to a large extent, and have done months, bordering on years, of research into his life and times, both for a play I wrote about the authorship argument, and for The Time Duchess, the fourth book in my time travel series, which takes place in Elizabethan England and also deals with the Argument. How does this relate to Jane Austen, you might ask? Well, it is clear from the mention that Austen makes in many of her novels that she, like most Brits, knew his works well. I am not British, but I have come to understand that Shakespeare runs in the veins of the British people like Mark Twain runs in that of Americans, and Jane was certainly no exception. As a matter of fact, in Mansfield Park, Edmund Bertram states: “No doubt one is familiar with Shakespeare in a degree…from one’s earliest years. His celebrated passages are quoted by every body; they are in half the books we open, and we all talk Shakespeare, use his similes, and describe with his descriptions…” Additionally, scholars have noted how the plots of some of Austen’s books, or parts of them, might be directly influenced by the plays, such as Pride and Prejudice by Much Ado About Nothing. I have used references to Shakespeare in many of my JAFF novels because I love intermingling two of my favorite English writers, Will and Jane, though they are separated by almost two centuries. Therefore, I thought it might be interesting to look at a few more of Austen’s references to the Bard. In Sense and Sensibility, for example, Mrs. Dashwood utters, after Willoughby has left them with very little explanation: “We have never finished Hamlet, Marianne; our dear Willoughby went away before we could get through it. We will put it by, that when he comes again…But it may be months, perhaps, before that happens.” These, of course, are no words of comfort to Marianne at all. Sarah Siddons, a Regency era actress, portraying Lady MacBeth. You don’t have to be an expert, or live in the Regency era, to quote Shakespeare though. He has such a huge influence over our day to day speech that today we quote him without knowing it. For instance, did you know these expressions come from Shakespeare? I could go on and on. 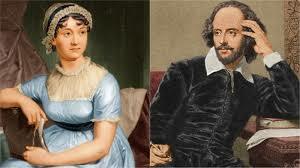 The point is, Jane Austen was influenced by Shakespeare more than just in her writing. She must have quoted him, and referred to him in everyday life probably without even thinking about it, like we do. Such a realization gives me one more reason to feel connected to her, and helps me see how Shakespeare influences us all, writers or not, as much now as in Austen’s day. This was interesting. We only read and studied Romeo and Juliet in High School but I made a point of buying a number of his stories in DVD form. Shakespeare is one I feel unequipped to read alone; I think one needs a mentor or guide to understand his works in depth. I do like to read passages of his when used in various stories; they do sound do lovely. The various expressions listed above were educational for me; I had not read such a list, even though short, before. Thanks for sharing. Shakespeare is definitely the go-to guy for awesome quotes, and for adding a flair in one’s story! I love putting Shakespeare in my JAFF as well. Thanks for the interesting post about connecting them even more! Last fall, I had hoped to see the exhibit honoring both of them in Washington DC but had to change my plans. I thought it was awesome that they put her side by side with him! They definitely belong together in honor! Thanks for the comment, Caryl! Georgina, This is such a fun post. What a treat to learn that so many of “our” expressions came from Shakespeare! And the idea that you wrote a play and then inserted it in one of your Time Travel novels! Wow! I must confess, I love your Time Travel series as much as your JAFF stories. I have read all but the Time Duchess and now I will have at it, just to see how you worked in your play. Cheers! Thanks so much, Barbara! I do think The Time Duchess is a particularly fun one! I have not really sat down and read Shakespeare except for some of his sonnets, although I do occasionally have one of my characters refer to him. In my ‘Four Lords’ I had my lady savant having memorized all of his sonnets. In fact, with her photographic memory (couldn’t refer to that as such in Regency times) she remembered everything she read. 🙂 Did read ‘MacBeth’ in school years ago. And I have noticed that Austen referred to or quoted from his works like you noted. This was an interesting post, Georgina, that got me to thinking that I should take time to read some of Shakespeare as I have a volume of his complete works. Maybe I should move it to the top of my humongous TBR list. 🙂 Thank you for the post. Though I always think it’s worthwhile to read Shakespeare, Gianna, be on the look out for local groups doing his plays. Depending on where you are, you can often see outdoor productions for free in the summertime. I think Shakespeare is much more accessible on the stage – where he was meant to be! Excellent post. You have given us much to think on. The relationship between the authors was really interesting. I loved finding out that those little sayings of ours are not so new. Oh well, I love knowing that Uncle So-in-so was actually quoting Shakespeare all these years. We all have one in the family that uses old sayings to make a point or support a stance. Well done. Interesting post. I like to think that Jane Austen had Emma misquote on purpose as I don’t believe she would have gotten it wrong. I think it’s fun to add in references to other literature in JAFFs. We mention Shakespeare moderately often. Sometimes Sir Walter Scott, although I try to remember to leave off the ‘sir’ as he didn’t have that title until 1820. I read an essay once that had collected phrases many people attribute to the bible, but that are actually from Shakespeare. To me, that really emphasized how influential his phrases are (or maybe it shows we should all read more?). I like to think Jane Austen had Emma misquote Shakespeare on purpose. Another thought, though, is to question how identical various printings of Shakespeare’s works have been over time. Yes, there are variations in Shakespeare’s works over the years as they were copied and reprinted. Enlightening comment, thanks!